of the Nuremberg classical scholar Nikolaus Weber, with 51 entries by scholars, scientists, and artists of the time, including Andreas Celsius, Johann Gabriel Doppelmayr, and Christoph Jacob Trew. Nürnberg und Altdorf. 179 Bll. mit 51 Eintragungen sowie eh. Besitzvermerk Webers auf Bl. 2r. Zeitgenöss. brauner Lederband mit reicher Rücken- und Deckelvergoldung, Brokatpapier-Vorsätzen und dreiseitigem Goldschnitt. Quer-8vo. 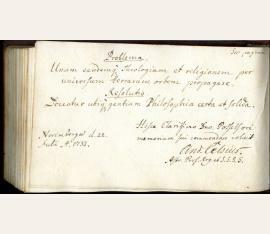 Unique scholars' album of the philologist Nikolaus Weber (1699-1751), headmaster of the Nuremberg Holy Ghost school, with entries by scholars mainly based at the Universities of Nuremberg and Altdorf. One of the most important among the contributors to this volume, almost all of which are biographically recorded, is the Swedish astronomer Andreas Celsius (1701-44), who on 22 July 1733 penned these lines: "Problema: Unam eandemq[ue] theologiam et religionem per universum terrarum orbem propagare. - Resolutio: Doceatur ubiq[ue] gentium Philosophia certa et solida" (Problem: How to spread the same theology and religion throughout the entire world? - Solution: Teach all peoples a certain and solid philosophy). On behalf of the Swedish king, Celsius had visited the principal observatories of Europe in 1732/33 to form an opinion of the current developments in astronomy. His scientific "Grand Tour" had also led him to Nuremberg, where he had spent three months at the home of the astronomer Johann Gabriel Doppelmayr (see below) and had regularly participated in the specialist discussions hosted by the physician Christoph Jacob Trew (see below). 1733 is also the year of Celsius's "316 Observationes de Lumine Boreali", the first comprehensive treatise on the Northern Lights, published by Endter in Nuremberg. That year, Celsius also performed the first exact geographical measurement of the town's dimensions. - Celsius's host Johann Gabriel Doppelmayr (1677-1750), known for his 1750 "Atlas coelestis", contributed his entry many years before Celsius: on 17 July 1717, he dedicated a quotation from Seneca ("Animum sursum vocant initia sua", Epist. 79). The two opposite pages by Celsius and Doppelmayr are connected by a caption (by one of the two scientists): "Sic pagina jungit amicos" (Thus a page links friends). - Another important entry is that of the physician and botanist Christoph Jakob Trew (1695-1769), who had studied medicine in Altdorf and then undertook a three-year tour through Germany, Switzerland, France, and the Netherlands. In 1720 he settled in Nuremberg as a general practicioner and became a member of the most important scientific academies; his library, encompassing more than 34,000 volumes, was considered the greatest collection of naturalist literature of its time. No less important was Trew's autograph and correspondence collection with its natural-scientific focus, containing more than 19,000 letters by polymaths from the early Renaissance to Enlightenment (including Albrecht von Haller, Conrad Gesner, and Lorenz Heister). Today, Trew is frequently associated with his principal botanical work, "Plantae selectae" (1750-73). - For many entries, Weber later added the date of the contributor's death (if he outlived them), which in several cases offers a more precise date than hitherto available. - Other contributors include Siegmund Jakob Apin (writer, pedagogue, and classical scholar, 1693-1732), Andreas Christian Eschenbach (theologian and classical scholar, 1663-1722), Johann Wilhelm Feuerlein (theologian, 1689-1766), Christoph Fürer von Haimendorf (poet, 1663-1732), Gottfried Engelhart Geiger (pedagogue, 1681-1748), Johann Jakob Hartmann (theologian, 1671-1728), Georg Jeremias Hofmann (teacher of oriental languages and theologian, 1670-1732), Johann David Köhler (historian, 1684-1755), Michael Friedrich Lochner von Hummelstein (physician and polymath, 1662-1720), Bernhard Walther Marperger (theologian and Lutheran poet, 1682-1746), Jonas Meldercreutz (mathematician and bibliophile, 1713-85), Gustav Philipp Mörl (theologian and librarian, 1673-1750), Johann Heinrich Müller (physicist, astronomer, and mathematician, 1671-1731), Joachim Negelein (theologian and classical scholar, 1675-1749), Johann Heinrich Schulze (physician and classical scholar, 1687-1744), Christian Gottlieb Schwarz (classical scholar and historian, 1675-1751), Gottfried Thomasius (polymath and physician, 1660-1746), Johann Siegmund Wernberger von Wernberg (jurist, 1678-1737), Justin Wetzel (preacher and professor of history and politics, 1667-1727), Georg Karl Wölker (jurist, 1660-1723), and Johann Wülfer (classical scholar and professor of church history, 1651-1724). 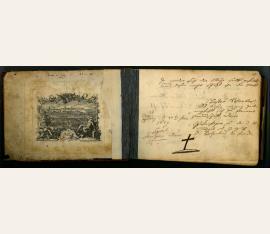 - Decorative binding insignificantly rubbed, otherwise splendidly preserved autograph album of enormous value for the history of science. Autographs by Celsius, Trew, and Doppelmayr are of the utmost rarity. - Detailed list available upon request..
of Johann Christoph von Selpert. Berlin, Bremen, Dresden, Hamburg, Göttingen, Lausanne, Leipzig, Meißen, Regensburg, Zürich. 86 Bll. mit 93 Einträgen, 5 ganzseitigen Illustrationen (1 lavierte Bleistiftzeichnung, 4 Gouachen) und einer kleinen aquarellierten Blume im Text. Pergamentband der Zeit mit farbigen Verzierungen in Lackmalerei und Goldprägung auf Deckeln und Rücken. Bro. 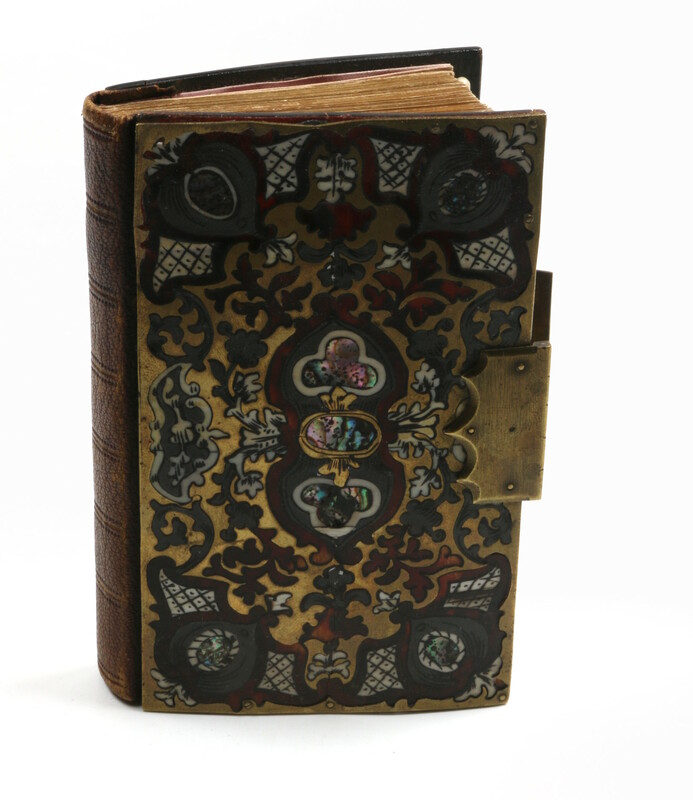 Uncommonly beautiful friendship album belonging to the law student Johann Christoph von Selpert (d. 1817), later councillor and delegate of various cities at the Regensburg Imperial Diet. Among the various contributors are many important scholars of the late 18th century, including Moses Mendelssohn, Johann Bernhard Basedow, Salomon Gessner, A. F. Büsching, and Christian August Clodius. - The earliest contributors are mostly Regensburg relatives of Selpert's, including Johanna Elisabetha née Harrer, wiife of the local merchant and freemason Ludwig Leonhard Schkler (1738-1807), but also the 13-year-old Benedikt Friedrich Springer (1756-1803), later a preacher of note. Soon, more important personages are added whom Selpert met during his University years at Leipzig: the Rosicrucian Adam Michael Birkholz (1746-1818), who published under the pen name "AdaMah Booz", the preacher and hymn poet Johann Gottfried Schöner (1749-1818), the later law professor Christian Rau (1744-1818), as well as the historian Johann Gottlob Böhme (1717-80), the law scholar J. H. Wilmerding (1749-1828), later the mayor of Braunschweig, the educator Johann Bernhard Basedow (1724-90), the poet and philosopher Christian August Clodius (1737-84), the theologian and classical scholar Johann August Ernesti (1707-81), director of Leipzig's Thomasschule, and the city captain Johann Christian Krappe (1709-91). 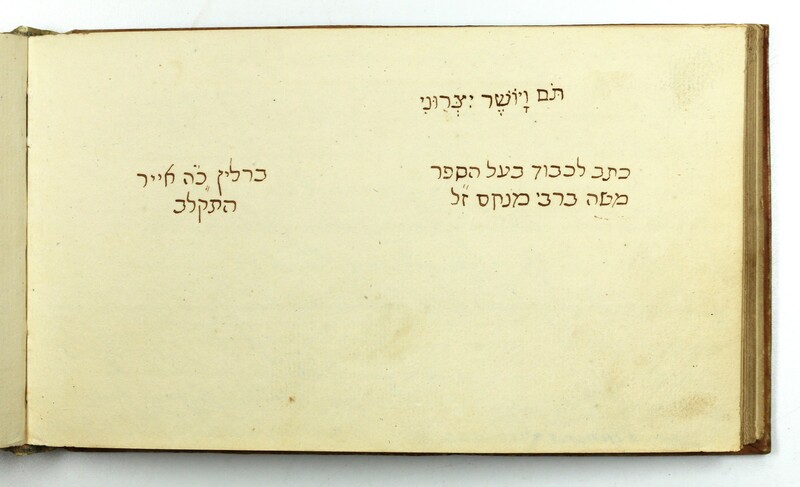 In Berlin, Moses Mendelssohn signs himself (in Hebrew) on 25 Iyyar 5532 (i.e., 28 May 1772), as does the geographer Anton Friedrich Büsching (1724-93); a Hamburg contribution is by the Linné student Johann Christoph von Heidenstam (1739-74); others, from Göttingen, are by Johann Heinrich Prieser (1749-1801) and Johann Jakob Besserer (1753-1834), both of whom soon would make their careers in Augsburg as concillors and even as mayor. Further journeys lead Selpert to Dresden, Meissen, and Bremen. 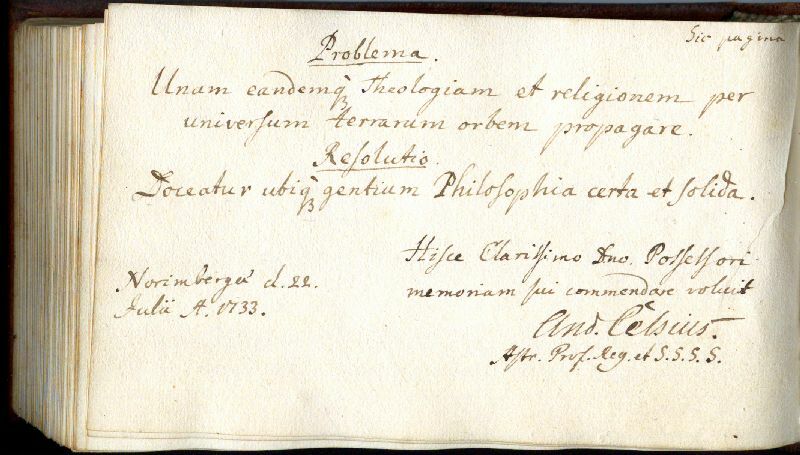 Contributions from Lausanne (1773) include the physician and chemist Heinrich Struve (1751-1826), the naturalist Jakob Samuel Wyttenbach (1748-1839), and the jurist Samuel Porta (1716-1790); in Zurich the poet Salomon Gessner (1730-88) signs, as does the physician and writer Johann Kaspar Hirzel (1725-1803). 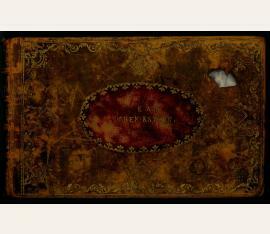 - Selpert's coat of arms (an ink drawing on strong wove paper) is inserted loosely. 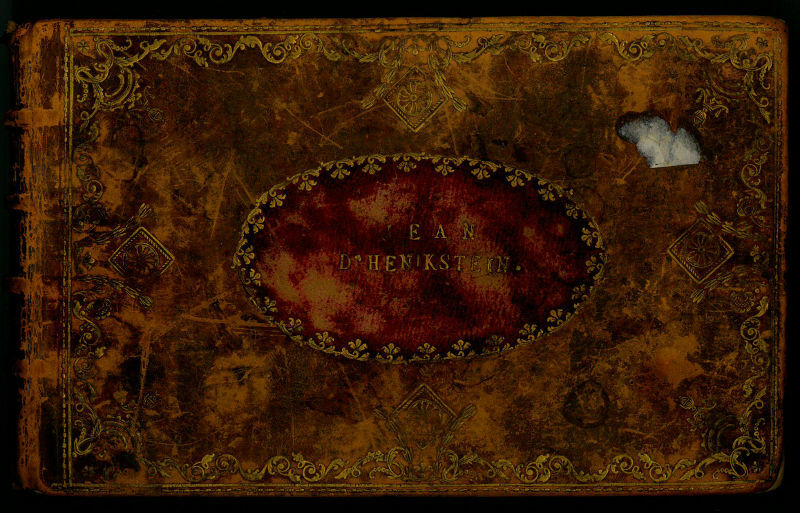 A title page and some four leaves were removed from the album, apparently at a very early date. Spine somewhat sunned. A complete list of all contributors is available upon request..
des Johann von Henikstein. Wien, Dresden, Triest, Hamburg, Danzig, Riga, Breslau, Berlin u. a. Titel, 345 num. SS. (es fehlen die SS. 56/57, 66/67, 76/77, 87/88, 89/90, 106/107, 248/249, 278/279, 309/310, 329/330) und 11 nn. Bll. Lederbd. d. Zt. mit Deckel- und Rückenvergoldung. Qu.-8vo. Johann von Henikstein war der Sohn des Großhändlers Abraham Hönig (1745-1811; 1784 geadelt; ab 1807 Ritter/Edler von Henikstein) und seiner Frau Karoline Josefa, geb. Seligmann (1748/53-1823); 1781 trat die Familie vom Judentum zum katholischen Bekenntnis über. Johanns Bruder Joseph erwarb sich Verdienste als Direktor der Oesterreichischen Nationalbank und als eifriger Förderer der Musik, als der er in seinem Haus regelmäßig Konzerte veranstaltete und zu den Freunden Wolfgang Amadeus Mozarts gehörte. - Das mit 30 meist sehr sauber ausgeführten Federzeichnungen, Aquarellen u. a. versehene Stammbuch umfaßt etwa 120 Einträge in deutscher, französischer, italienischer und englischer Sprache. Unter den Einträgern finden sich: Dr. v. Anreitter, Christoph v. Schrötter, Friedrich Pelikan, Therese v. Schrötter, Joseph Sauter, Vinzenz Zay, Alexis de Cappa, Julius v. Henikstein, G. Haeseler, D. Loehr, Daniel Abegg, Elise v. Jonak, Anton v. Uhl, Lisette Hoenigfeld, J. Loewe, Gottfried August Lutteroth, Graf Castiglioni, Ignaz Schumann v. Mansegg, Rosina Haen, Charlotte v. Specht, Therese und Felix Gourcy, Catharina Chiappone, Elisabeth v. Henikstein, Joseph v. Henikstein, Gräfin Eleonora Hendl, Philip Salomon, Fanny v. Koerber, J. Mendelssohn u. v. a. - Innen tlw. etwas fleckig; mit umlaufendem Goldschnitt; Deckel etwas beschabt und bestoßen bzw. angeplatzt..
des Johann Heinrich Scherber. Jena und Erlangen. 143 Bll. (pag. SS. 27 bis 346), 11 Bll. Register, 1 Bl. 283 Einträge mit 13 Scherenschnitten/Silhouetten, 3 einmontierten Kupferstichen (einer davon koloriert) und 1 kolorierten Zeichnung (Studenten beim Billardspiel). Lederband der Zeit. Qu.-8vo. Der Inhaber des vorliegenden Stammbuches, Johann Heinrich Scherber (1759-1837), war Pfarrer von Bischofsgrün und später dann von Selb. Die Einträge entstanden ausschließlich während der Studentenzeit in Jena (Immatrikulation am 23. X.1777) und Erlangen (Immatrikulation am 03. 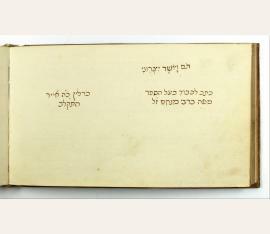 V. 1779). Hervorzuheben ist ein bislang nicht bekannter Eintrag des Dichters Johann Peter Hebel (S. 102) und daß einige Beiträger einen Bezug zu Goethe haben, so etwa der "Onkel von Christiane von Goethe", Justus Herrmann Deahna, andere zu Jean Paul, etwa Johann Nicolaus Apel oder der Schwiegervater von Jean Pauls jüngster Tochter Odilie, Christian Hake. Unter den Eintragungen finden sich u. a.: 1) Erlangen, 27.06.1779. Friedrich Gustav Metzger (1762-1782) aus Rothenburg; in das Stammbuch des früh Verstorbenen hat sich Johann Peter Hebel eingetragen; der von Metzger mit einem Kommentar versehene Eintrag des Dichters ist wiedergegeben bei Pietsch. Das Stammbuch liegt im Museum für Angewandte Kunst in Frankfurt a. M. - 2) Erlangen, 21.09.1780. Johann Nicolaus Apel ( 1757-1823), deutscher Autor, Naturforscher, Konstrukteur und Politiker. Stand u. a. in Briefkontakt mit Jean Paul, der von seinem Vater, dem Pastor Johann Apel (1726-1779) getauft worden war. - 3) Erlangen, 16.10.1780. Georg Christian Elias Erb (1759-1826), Pfarrer in Schornweisach, später in Neudrossenfeld. War als Feldprediger 1782-1784 bei den Bayreuther Regimentern in Amerika und nahm dort an den Kämpfen der Amerikanischen Revolution teil. Verfasser einiger Predigten. - 4) Jena, 14.03.1779. Johann Wilhelm Schmidt (1760-1816), Pfarrer, zuletzt in Buggingen. Freund des Dichters Johann Peter Hebel, der sich gleich zwei Mal in sein Stammbuch eingetragen hat, das in der Badischen Landesbibliothek in Karlsruhe liegt. - 5) Erlangen, 1780. Johann Gotthard Gericke (1759-1783), Theologiestudent aus Riga, der auf der Heimreise nach Riga ertrank. Sein Stammbuch ist erhalten geblieben, in dieses haben sich Goethe, Wieland und Herder - mit einem Gedicht - eingetragen. - 6) Erlangen, im März 1779. Johann Peter Hebel (1760-1826) mit einem Gedicht: "Fehlt innen Ruhe nicht, was fehlet meinem Leben. | Als was entberlich ist, und unentberlich scheint? | Solt ich bei iedem Unfal beben, | und weinen, wan die Torheit weint | Zum Andenken der ungeheuchelten Freundschaft von deinem treuen Freund J. P. Hebel [...]". Der vorliegende bislang unbekannte Hebeleintrag zitiert - wohl aus dem Gedächtnis - eine Strophe aus dem Gedicht "Glückseligkeit" des Dichters Johann Peter Uz. - 7) Erlangen, 04.05.1779. Johann Friedrich Plitt (1761-1823), ab 1803 "von" Plitt, Dr. iur., Hofrat, Minister-Resident usw. - 8) Erlangen, im May 1779. Ludwig Sebastian Zehelein (?-? ), bis 1803 Conrector des Lyceums, ab 1803 Rector der Lateinschule in Tirschenreuth, Bruder des Lyrikers Ludwig Sebastian Zehelein. - 9) Erlangen, 07.05.1779. Ehrenfried Hans Friedrich Ferdinand Busch (1756-1816), als Secondeleutnant bei den Ansbacher Jägern in den Jahren 1781-1783 in Amerika kämpfend (in derselben Einheit wie die Einträger Erb und Deahna), später Hauptmann und Stadtvogt in Crailsheim. Busch "verliess Erlangen am 14.May in der Hoffnung, sein Glück als Officier in Amerika zu machen. Der Himmel begleite deinen Entschluß, gute Seele!" - 10) Erlangen, September 1780. Philipp Adolf Besserer von Thalfingen (um 1756- 1779), Sohn des Ratsältesten Christoph Erhard Besserer von Thalfingen, ertrank 1789 bei Bövingen, mutmaßlich Suizid. Sein Stammbuch liegt in der HAAB in Weimar (StB128). - 11) Erlangen, Nov. 1780. Sebastian Andreas Balthasar von Hößlin (1759-1845), bedeutender Stadtbaumeister der Stadt Augsburg. - 12) [Erlangen], 1779. Martin Heinrich Friedrich Pilger (1760 Wetzlar-1838 Charkov), zuletzt Ordinarius für Veterinärmedizin in Charkov. Nach einer militärischen Karriere veröffentlichte der Autodidakt Pilger zahlreiche Aufsätze zum Thema Veterinärmedizin, dies unter Nennung seines Offiziersranges als Hauptmann. Daneben veröffentlichte Pilger 1791 die sog. "Wezlarische Annalen", die ihn als echten deutschen Aufklärer zeigen, der sich mit buchstäblich allen anlegt. Bis heute von hoher Bedeutung seine Abhandlung "Ideen über die Behandlung der Juden in Deutschland", die ihn als Vorkämpfer der Juden-Emanzipation ausweisen. Der Ruf an die Universität Charkov in der Ukraine war Diskussionspunkt bei J. W. v. Goethe. In Charkov hat sich dieser streitlustige Mann dann mit allen überworfen. Zu ihm wird bemerkt: "Dies wenige mag von dem Charakter dieses Ehrenmannes zeugen | war zu nichts anderes tüchtig als zur Tragung der Flinte" und "General aller Schisser und dummen Jungen". - 13) Erlangen, Merz 1781. Ludwig Steinbrenner (1759-Großbödungen), Theologe. - 14) O. O. u. D. Justus Herrmann Deahna ( 1758-1825 Bayreuth) zuletzt Justiz- und Regierungsrat in Bayreuth. Nahm als junger Mann als Leutnant der Ansbacher Jäger für ca. 2 Jahre an dem Unabhängigkeitskrieg in Amerika teil. Seine Tochter Helene heiratete 1801 Christian August Vulpius, den Schwager Goethes, die andere Tochter Rosalie den Bankier Falkner. Deahna wird wegen dieser verwandtschaftlichen Beziehungen, die ihm Tischeinladungen mit Goethe einbrachten, in der Literatur als "Onkel von Christiane von Goethe" bezeichnet. - 15) . Erlangen, Mai -79. Justus Friedrich Zehelein (1760-1802), Schriftsteller, Lyriker, Komponist, Radierer. Friedrich von Matthisson hat ihn mit seinen Werken in Band 14 seiner Lyrischen Anthologie aufgenommen. - 16) Erlangen, 10.11.1780. Peter Adam Freiherr Liebert von Liebenhofen (1759-1818), Augsburger Bankier, Sohn des (weitaus berühmteren) Benedikt Adam Liebert, des Erbauers des Schaezlerpalais in Augsburg, in dem Marie Antoinette angeblich ein Paar Schuhe durchgetanzt hat. - 17) Erlangen, 17.08.1779. Christian Heinrich Gottlieb Harke(?-nach 1823), bayerischer Appellationsgerichtsrat, Verfasser eines Kommentars zum Bergrecht mit dem Titel "Commentar über das Bergrecht" (1823) und eines Lehrbuches zum Bergrecht. Sein Sohn, der spätere Hauptmann Friedrich Harke (1797-1873) heiratete 1829 die jüngste Tochter Jean Pauls, Odilie Richter. Auf den Briefen Friedrich Harkes basiert im wesentlichen das Buch von Christiane Pritzlaff "Geliebt und vergessen: Odilie Richter - Jean Pauls jüngste Tochter" (2013). - 18) Erlangen, 28.11.1780. Immanuel Gottlieb Koch (1762-1788 in türkischer Gefangenschaft), war ab 1788 dem österreichischen Infanterieregiment Nikolaus Esterhazy zugeteilt, geriet dann in türkische Gefangenschaft. (Das Regiment hatte 1788 die Festung der Osmanen in Schabatz, heute: Sabac/Serbien, gestürmt.) - 19) Erlangen, Mai 1779. Christoph Ludwig Schreiber (1758-1839), zunächst Deputierter der Stadt Heilbronn in den napoleonischen Kriegswirren, später badischer Hofrat, in der Zeit von 1817-1820 in Korrespondenz mit dem Freiherrn von Stein. Führte häufig Protokoll bei den Experimenten seines Freundes Eberhard Gmelin, v. a. bei der Behandlung der Caroline Heigelin, dem (so wird vermutet) Vorbild für das "Käthchen von Heilbronn" von Kleist, der seinerseits mit Schreibers Kommilitonen Georg Christian Wedekind nahe befreundet war.. 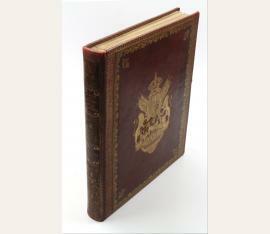 Friendship album of Princess Anna of Hesse-Darmstadt. Zumeist Darmstadt sowie Altenburg, Bad Homburg, Bad Kissingen, Baden-Baden, Berchtesgaden, Berlin, E. 84 Bll. mit Einträgen von mehr als 230 Persönlichkeiten. Mit 1 gest. Spitzenbild, 1 kl. Federzeichnung und 1 Trockenblume. Halblederband der Zeit über Holzdeckeln; beide Deckel mit reichen ornamentalen Auflagen und Intarsien aus Bein, Horn, Messing und Pe. Remarkable, wide-ranging friendship album of Princess Anna of Hesse and by Rhine (1843-65), only daughter of the Hessian general Karl of Hesse and Princess Elizabeth of Prussia. In May 1865 she married Grad Duke Frederick Francis II of Mecklenburg-Schwerin but died of puerperal fever a week after the birth of her only child. Both her parents as well as her later husband have signed her album. - The entries are mainly by members of the European aristocracy, including Archduke Albert of Austria-Teschen (1817-95), Czar Alexander II of Russia (1818-81), Princess Alice of Great Britain (1843-78), Duke Frederick of Anhalt (1831-1904), Countess Charlotte Fugger (1830-76), Gustav Prince of Vasa (1799-1877), Prince Henry XXII Reuss-Greiz (1846-1902), Helena Louise of Mecklenburg-Schwerin, Duchess of Orléans and Chartres (1814-58), Duke Joseph of Saxe-Altenburg (1789-1868), Joséphine de Beauharnais, Queen of Sweden and Norway (1807-76), Louis Philippe Albert d'Orléans, Comte de Paris (1838-94), King Ludwig II of Bavaria (1845-1912), King Maximilian II of Bavaria (1811-64), Princess Sophie of Orange-Nassau, Grandduchess of Saxe-Weimar-Eisenach (1824-97), Countess Théodolinde of Württemberg, Princess of Leuchtenberg (1814-57), Princess Therese of Oldenburg, née Nassau Weilburg (1815-71), Prince Wilhelm of Schaumburg-Lippe (1834-1906), and many others. The later "Swan King" Ludwig II has signed his name twice: once as a six-year old, together with his mother Marie Friederike of Prussia (1825-89), and again as a twelve-year-old, alone. Other entries by children include Mary Victoria Hamilton (1850-1922), who would marry Prince Albert I of Monaco in 1869, and the later ethnologist, zoologist and botanist Therese of Bavaria (1850-1925). Other contributors from the field of science and scholarship include the explorer Adalbert von Barnim (1841-60), the geologist Wilhelm von Branca (1844-1928), and the theologian Carl Heinrich August von Burger (1805-84). - Pages numbered in pencil up to p. 160 by a later hand. Provenance note on the final page of text (p. 133) by Marie of Schwarzburg-Rudolstadt, Grand Duchess of Mecklenburg (1850-1922): "This book belonged to the Grand Duchess Anna of Mecklenburg née Princess of Hesse-Darmstadt; it was later given to Duke John Albert of Mecklenburg in Dezember 1919 [...]"..
des Friedrich Wilhelm Stauwe. Jena. Mit 71 Einträgen auf 346 (statt 356) SS. und 6 Bll. Personenverzeichnis. Mit 7 Gouachen auf Pergament und 1 koloriertem Kupferstich. Brauner Kalbslederband der Zeit mit reicher Rücken- und Deckelvergoldung und umlaufendem Goldschnitt. Vorsätze in zeitgenö. Hübsches Album des in Jena studierenden F. W. S. (so am Vorderdeckel geprägt), in das sich 71 Kommilitonen eingetragen haben. Besonders erwähnenswert sind die hübschen Gouachen, die wohl alle von demselben Künstler stammen und u. a. studentische Szenen (Einzug zu Pferd und in Karossen, nächtliche Versammlungen), ein "Memento mori" mit einem Mönch in einer Klause, Landschaften und Allegorien auf die Tugend zeigen. - Der hübsche Einband mit Rocaille- und Gittermuster nur gering berieben, beschabt und bestoßen; am Hinterdeckel die geprägte Jahreszahl 1756; innen stellenweise leicht fleckig; S. 1 mit photographischem Exlibris eines Walter Amon. Friendship album of Clothilde de la Rochelambert, comtesse de La Bédoyère (1829-1884), with numerous entries by members of the European aristocracy. Fontainebleau, Saint-Cloud, Compiègne, Paris, Nizza, Biarritz, Bad Kissingen, Schwalbach, Baden. 34 teils beidseitig beschriebene (uneinheitlich numerierte) Bll. mit über 250 (vereinzelt einmontierten) Eintragungen. Roter Maroquinband mit goldgepr. Bordüre und Deckelprägung in Anlehnung an das Wappen der Könige von Sardinien. Seidenpapiervorsätze und. 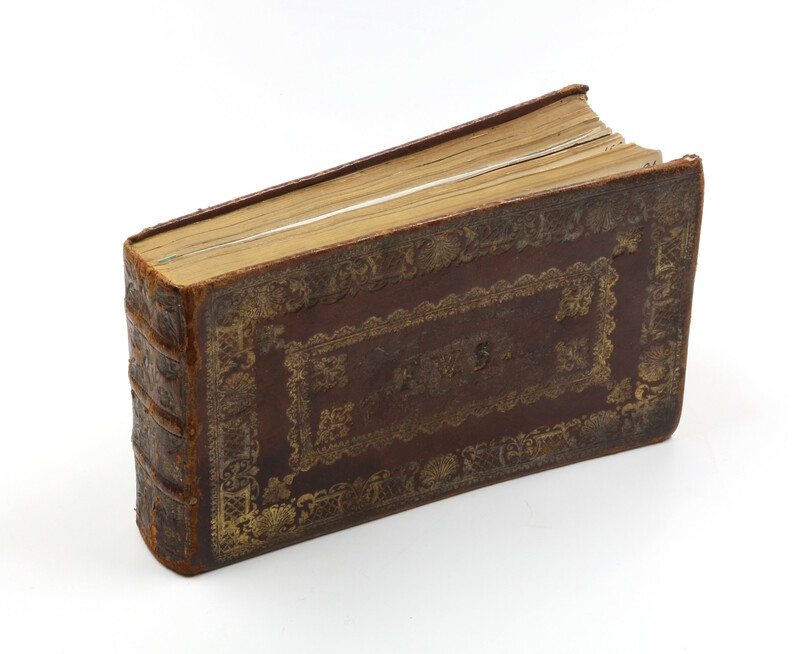 Exceptionally plentiful friendship album owned by Comtesse de La Bédoyère, daughter of the senator Henri de La Rochelambert (1789-1863), wife of Georges Huchet de La Bédoyère (1814-67) and court lady to Empress Eugénie, wife of Napoleon III. Indeed, the first entry in the album belongs to the the emperor himself; this is followed on the same page by Eugénie with a quotation from Sophie d'Arbouville's poem "Je crois": "Je crois au Souvenir, au long regret du cœur, / Regret que l'on bénit comme un dernier bonheur, / Crépuscule d'amour, triste après la lumière / Mais plus brillant encore que le jour de la terre!" This is succeeded by the signature of the couple's only son, the eight-year-old Napoléon Eugène Louis; at the bottom of the page is a four-line German quotation from Schiller, which Napoléon III adds in Biarritz on 8 Oct.
1865. Another entry by Eugénie is on fol. 27r, and there are further entries by her son on fol. 21r and 27r (with a little drawing). - Two other noteworthy entries are on pages 21v and 23v: the first is by Bismarck, who signed in Biarritz on the 19th of October 1865, the very month when the secret negotiations between Prussia and France had begun over possibly coalitions before the Austro-Prussian War of 1866. 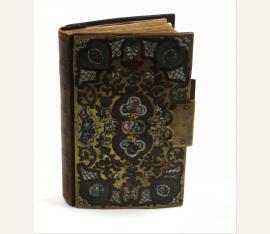 The second, written at about the same time, is by Leopold, Prince of Hohenzollern and his wife Antonia (fol. 23v). Leopold is considered a pawn of the high politics of his age. In 1870 Bismarck would urge him to accept the Spanish Crown, a move fiercely opposed by Napoléon III. Although Leopold quickly yielded, it was this affair that would ultimately spark the Franco-Prussian War. 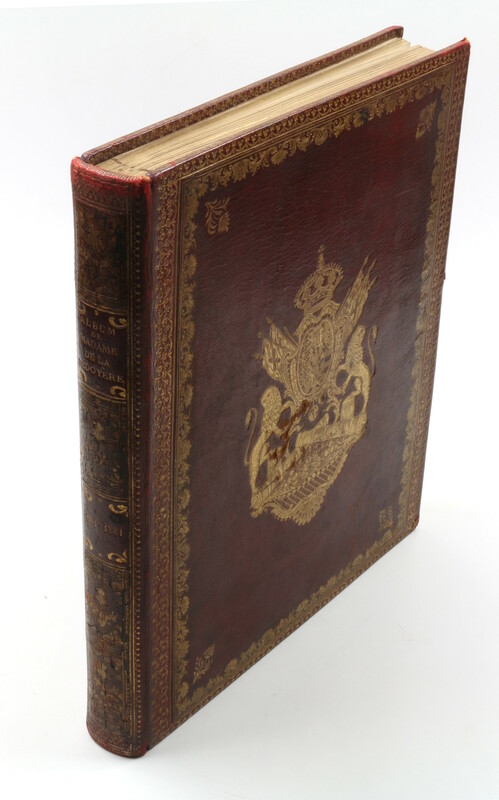 - The numerous other contributors include: Alexander II of Russia (9r); Amadeus I of Spain (16r); Isabella II of Spain and her children Isabella and Alfonso (17r); Sophie Queen of the Netherlands (8r); Emperor Franz Joseph I and his wife Elisabeth (14r), as well as Elisabeth's lady-in-waiting, countess Caroline Hunyady (12v); Frederick Grand Duke of Baden, and his wife Louise (9a); Marie, Princess of Baden and Duchess of Hamilton (10r); Charles, King of Württemberg, and his wife Olga (37r); Frederick, Prince of Denmark (24r); Umberto I of Italy (7r); Marie Clotilde of Savoy (wife of Prince Napoléon, 7r); Grand Duchess Maria Nikolaievna of Russia (27v); Grand Duke Charles Alexander of Saxe-Weimar-Eisenach and his wife Sophie Princess of the Netherlands (22r); Louis I of Portugal and his wife Maria Pia of Savoy (19v); Frederick, Grand Duke of Mecklenburg (13r & 17r); George, Duke of Mecklenburg, and his wife Catherine, Grand Duchess of Russia (18r); Marie, Grand Duchess of Mecklenburg-Strelitz (4v); Adolf, Duke of Nassau (9r & 14v); Pauline, Princess Metternich (2v, 8v, 14v with her daughter Sophie and her aunt Hermine, 31r with her daughters Sophie, Antoinette Pascalina, and Clementine Marie, as well as Rosa, Duchess of Hohenlohe-Sternberg); Richard, Prince Metternich (9r); William I of Prussia and his wife Augusta (10r); Francis, Duke of Harrach (4v); Joseph Joachim Napoleon Murat (2r & 20v); Field Marshal Frederick of Wrangel (7v); the Duchess of Castiglione Colonna (known as a sculptor under the name Marcello, née Adèle d'Affry, 3v); Mélanie Renouard de Bussière Comtesse de Pourtalès (14v); Admiral Edmond Jurien de La Gravière (a four-line poem signed, 9v); Admiral Wilhelm von Tegetthoff (28v); Gustav Prince Blücher von Wahlstatt (9v, born 11 Oct. 1837, knight of the Order of Malta); the Mexican monarchist and ambassador to the court of Napoléon III, José Manuel Hidalgo y Esnaurrízar (3v); the philosopher Elme Marie Caro (a three-line poem, 11r); the politician and economist Félix Esquirou de Parieu (a nearly full-page poem, 10v & 11r); the artist Gustave Doré (with a fine drawing, 11r); the writers Hortense Cornu (7v), Edmond About (28r), and Prosper Mérimée (19r & 20v); Princess Alexandrine Dolgorouky (1834-1913, the mistress of the Tsar, 2v, with two lines from Byron); Ignacio Álvarez de Toledo y Palafox Portocarrero, Conte di Sclafani (son of the 16th Duque de Medina Sidonia, 1812-78, full-page sonnet 22v); Alexandre conte Colonna-Walewski (14v; possibly with his second wife Anna Maria Ricci, daughter of count Zanobi di Ricci and Isabelle née Princess Poniatowska, signing "Maria Walewski(y)". The album's final contribution is a photographic reproduction of F. X. Winterhalter's well-known portrait of Empress Eugénie. - Binding slightly rubbed; interior shows occasional brownstaining, but altogether in excellent state of preservation..